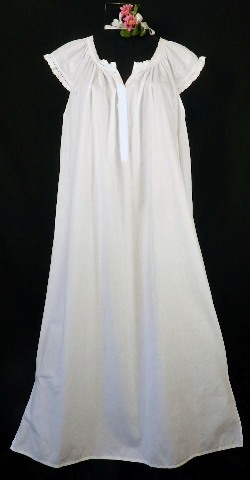 This simple and beautiful gown has been a favorite of our customers for years. A button placket part way down the front and an attractive sweeping fit lend to ultimate ease and comfort. Soft eyelet lace trims the neck and cap sleeves. This gown is awesome. Cool, comfortable and soft. I highly recommend.